Long, slow cooking produces deliciously flavoured chunks of steak that melt in the mouth. Serve with mashed potatoes and a green vegetable, such as sprouts. Preheat the oven to 170°C, gas mark 3. Place the flour either into a clean plastic food bag or onto a plate and season generously. Then, in batches, lightly dust the beef in the flour, shaking off any excess. Heat 1 tablespoon of the oil in a large flameproof casserole. In the hot casserole, fry the beef in batches of 5-6 pieces for 1-2 minutes on each side, until crisp and brown all over. Transfer to a warm plate and repeat, adding the remaining oil as required until all the beef has been sealed. Add the leeks and carrots and cook for 2-3 minutes until golden. Stir in the mushrooms, half the thyme leaves and all the bay leaves. 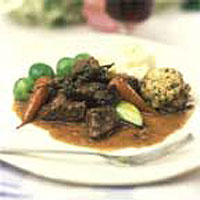 Return the beef to the casserole dish and pour in the stock and the Worcestershire sauce. Bring to the boil, then cover before transferring to the oven for 2 hours, stirring occasionally. To make the dumplings, sieve the flour and baking powder into a bowl, stir in the suet, parsley and remaining thyme and season generously. Stir in 4-5 tablespoons cold water, enough to make a soft, sticky dough. With floured hands, roll into 8 evenly sized balls, about the size of walnuts. Remove the casserole from the oven and stir. The beef should be tender and the carrots cooked. Check and adjust the seasoning if necessary. Drop the dumplings into the casserole and spoon a little of the liquid over the top. Cover and return to the oven for 25-30 minutes, or until the dumplings look light and puffy, then serve. Don't be tempted to rush the sealing stage: the beef will stick to the pan until it is properly sealed. Use sweet baby carrots instead of the Chantenay carrots, if unavailable.